Index and Penetration are two key elements of customer profiling and segmentation services from Mapping Analytics. We use indexes and penetration rates to help you discover market opportunity — where you can find more customers like your best customers. Creating an index is a statistical process. An index compares how a group of people, such as your customers or the population of a given market geography, rate against a norm in terms of their expected behavior. An index of 100 means the group (your customers, for example) will behave the same as the norm it is being compared against. An index over 100 means the group is more likely to behave in a specific behavior, such as purchasing your products; less than 100 and it is less likely. 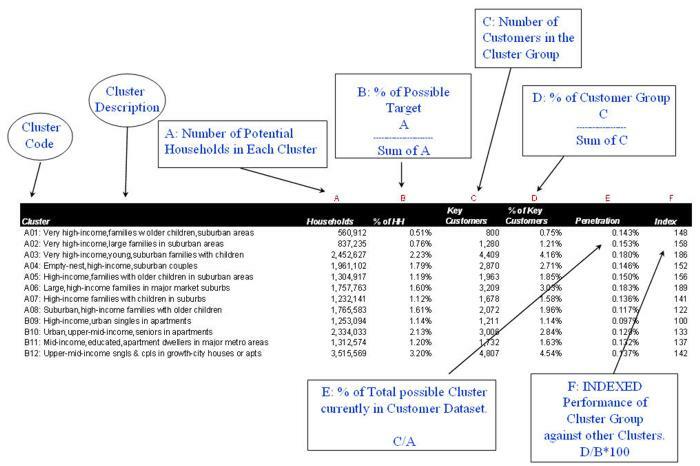 Penetration refers to how many customers you have in a given cluster, or customer profile, compared to the total size of the group. For example, you may have 5,000 customers in a trade area who fit profile A, which happens to represent your best customers, yet this trade area has a total of 100,000 people fitting profile A. In this case your penetration rate is 5% (5,000 is 5% of 100,000) — and there may be additional opportunity for you in this market.